Mountain Echoes 2016 is the most heart-achingly beautiful and evocative mountain fest in the world. It was in the summer of 2009, sometime in July, that the idea of Mountain Echoes was born. Her Majesty the Royal Queen Mother Ashi Dorji Wangmo Wangchuck had hosted a dinner where the guests included the Indian ambassador Pavan K Varma, Ravi Singh, publisher at Penguin books, and myself. Her Majesty is an accomplished writer, and her masterfully evocative book Treasures of the Dragon Kingdom had been published only recently. In the course of a splendid meal and animated conversation, not just about books, Varma suggested the idea of a literature festival in Bhutan. Her Majesty responded with enthusiasm, as did I. The Jaipur Literature Festival, of which I am a co-director, had already begun to make waves. “Mountain Echoes” was the title of a book of oral biographies of Pahari women that I had edited, and a festival we at Yatra books had recently hosted in Dehradun with the Himalayan Library. When things take off and are meant to happen, they gather a mysterious momentum and synchronicity. Here we are, with season seven of Mountain Echoes set to take off in Thimphu from August 26-28. And it is, in my biased view, the most heartachingly beautiful and evocative mountain festival in the world. Ambassador Pavan Varma and the India Bhutan Foundation brought the dream alive. With the formidable Mita Kapur of Siyahi as the producer, and me, Siok Sian Dorji, Pramod Kumar KG and Tshering Tashi as co-directors, the Bhutan Literature Festival has established a distinct and unique identity. Over the last six years we have hosted speakers like Ali Sethi, Alka Pande, Anuja Chauhan, Ashok Ferrey, Ashwin Sanghi, Barkha Dutt, Chetan Bhagat, Dasho Karma Ura, Dayanita Singh, Lopen Karma Phuntsho, Florence Noiville, Gavin Francis, Gulzar Sahib, Imtiaz Ali,Jerry Pinto, Kalki Koechlin, Kishwar Desai, Kunzang Choden, Laila Tyabji, Lily Wangchuk, Lucy Hawking, Marcus du Sautoy, Navtej Sarna, Paro Anand, Patrick French, Pawo Choyning Dorji, Sonam Kinga, Urvashi Butalia, Valmik Thapar, Vikram Seth, Wendell Rodricks and William Dalrymple. And the list goes on. The prime minister of Bhutan, His Excellency Lyonchhen Tshering Tobgay, has also participated as a speaker. Her Majesty The Royal Queen Mother Ashi Dorji Wangmo Wangchuck, the chief royal patron of Mountain Echoes, enthusiastically participates in the festival every year. The clock tower in Thimphu has echoed and resonated with music from The Raghu Dixit Project, Soulmate, Vivek Rajagopalan Quartet and Eka; and Bhutanese bands like Baby Boomers, Daydream Farmers, and Zhaw and the Ngorigaps. We have had bright-eyed youths and venerable monks, pop icons and cerebral thinkers, future prime ministers, film directors, Bollywood stars, and all manner of storytellers and thinking people in a passionate exchange of ideas and narratives. And this, our seventh year, when we welcome, among others, Amitav Ghosh and Pico Iyer, is going to be our best ever. 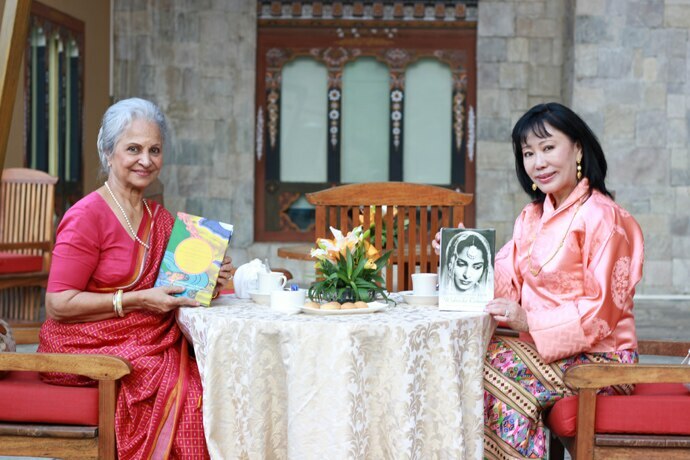 Retired police officer and Bhutanese crime writer “Yongba” Karma Tenzin asks a radiant Waheeda Rehman to sing a song for the audience, and she does! Arshia Sattar and Dasho Karma Ura trace the history of Hanuman in Indian mythology and religion, and discuss parallels with the “compassionate monkey” of the Jataka tales. Kalki Koechlin holds the audience spellbound with a stark dramatic monologue. Mahesh Dattani talks of theatre and things theatrical. Wendell Rodricks on style, fashion and aesthetics. Tshering Tashi on unclimbed mountains. You had to be there. I first visited Bhutan in 1999, and have been there perhaps 22 times now. I am a “Pahari” by birth and instinct, from Kumaon in the central Himalayas. Also read – What happens to all the fat books? Mountain people, in my understanding, are different, they have special qualities of grit and stubborn strength, wherever in the world their elevated homelands might be. I believe that the Himalayas have a continuity of culture which is not just geographical and latitudinal but goes deeper. Mountain Echoes has tried to reach out and connect on issues of environment ecology and biodiversity, and what better place on our planet than carbon-negative Bhutan? Music, oral traditions, folklore, food, and textiles connect the sweep of the Himalayan regions, and our festival is a platform for sharing these “Mountain Echoes”. The ancient kingdom of Bhutan is also the youngest democracy in the world. It is an honour to have been associated with those first early years, and all of us high altitude junkies have learnt and grown and been blessed in the process. Check these links for our programme for 2016. See you at “Mountain Echoes”.